Without doubt, every vehicle fleet manager, supervisor, or section commander is constantly concerned with “Savings and Safety.” Who wouldn’t be with the budget reductions, clawbacks, and the “more with less” strategies of the past few years? The Base Transport Section at CFB Borden is certainly no exception – savings and safety are key concerns here, given a fleet size of almost 1,000 vehicles, 100 professional drivers, and thousands of casual drivers. 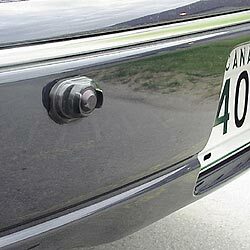 Safe Reverse Sonar sensors are visible in this vehicle bumper. Installation is simple and inexpensive. Historically, backing accidents have been a constant thorn in our collective side, whether it involved privately owned or Crown-owned vehicles. A catalyst in any vehicle accident, but especially when backing, is complacency or the idea “I drive my car, ergo, I can drive any car.” The truth however, is strikingly different. CFB Borden’s past experience reflects that the majority of backing accidents involved casual drivers operating staff cars, vans, and pick-up trucks. Last year, it appeared that costs were escalating and the potential for a serious accident was constantly in the forefront of the mind of all Base Transport personnel. This driver’s aid emits a beeping sound, warning of the presence of a person or an object behind a backing vehicle. The beeping frequency increases as the closing distance diminishes. Fortunately, a relatively new product is now available for commercial pattern vehicles that warns of obstacles while reversing. The “Safe Reverse Sonar” utilizes the principle of sonar and is an ultrasonic measuring and warning system for most utility cars and vans. 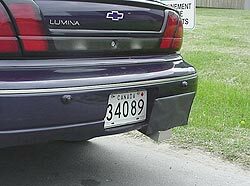 It provides the driver with an audible warning of any obstacle, unlike the audible warning devices currently used that warn the obstacle to get out of the way (fairly unlikely if the obstacle is a pole or another car). The device is wired into the vehicle’s back-up light circuit and is automatically powered and activated ONLY when the vehicle is shifted into reverse. If there is any object behind the vehicle, the sensors detect the object and bounce signals to the control unit, which then activates the three-stage beeper. The beeper, which is intermittent at a distance of 120 cm, becomes increasingly continuous the closer the vehicle gets to the object until, at a distance of 50 cm, the sound becomes a steady tone. Although the trial is ongoing and conclusive results of safety improvements and savings are not yet available, we have some positive indicators. Specifically, backing accidents at CFB Borden have decreased from 52 accidents in 1999 to just two accidents in 2000 to date. At an average installation cost of $250, the safe reverse sonar kits have already more than paid for themselves. With the increasing responsibilities and emphasis on due diligence within the CF/DND, this is one tool that is helping Base Transport personnel to relax – slightly – and one which appears to offer real promise.